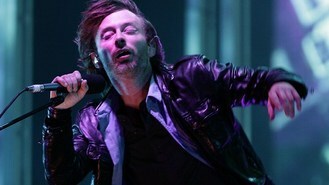 Thom Yorke has revealed that he always thinks of leaving Radiohead. The 44-year-old frontman admitted that he is constantly on the verge of quitting the band, and often wavers over their future, in a podcast interview with Alec Baldwin for US radio station WNYC. Asked by the 30 Rock star if he ever thinks that they are "done", Thom said: "I do that frequently. Frequently. It's never really the music, it's always everything else. Just stresses of life, whatever." But the married father-of-two admitted his bandmates - lead guitarist Jonny Greenwood, bassist Colin Greenwood, backing vocalist Ed O'Brien and drummer Philip Selway - don't feel the same way. "Not as much. They just wait for me to do it. But it changes," he said. Thom, who is focusing on his new band Atoms For Peace, is set to return to the studio with Radiohead to work on their ninth album, the follow-up to 2011's The King Of Limbs. Colin has said: "We're taking some time out whilst people are doing some other stuff, doing their own things, and the plan is to get back together again (at the) end of the summer." Nadine Coyle has announced that she is working on new music. Wiley has appeared to patch things up with his record label Warner, after reportedly claiming he would part ways with them. Justin Bieber has been given four weeks by German officials to pick up his pet monkey or else it will be placed in permanent care. Sir Elton John and his longtime songwriting partner, Bernie Taupin, will be presented with a special honour at this year's Songwriters Hall of Fame induction ceremony. New Kids On The Block star Jordan Knight thinks the former boyband's music is "more gentlemanly" on their latest album 10, as they've learned that charm works best. Ed Sheeran has revealed he almost impaled Taylor Swift with a sword while sharing her private tour plane. Ant and Dec are celebrating their first number one single - 17 years after their chart career came to an end. Tyler, The Creator has revealed Justin Bieber rejected a song he and Frank Ocean had written for him.